Ken Gass’s new Canadian Rep Theatre opens is second season with the premiere of Florence Gibson MacDonald’s How Do I Love Thee? substantially revised since its first version was staged in Calgary in 2010. The play which traces the 16-year-long relationship of Victorian poets Elizabeth Barrett (1806-61) and Robert Browning (1812-89). The first act of the play covering the poets’ courtship, elopement and move to Italy is quite promising. The second act dealing with Elizabeth’s addiction to laudanum and other drugs is tiresome and repetitive. Anyone who knows about the Brownings will find it annoying how much MacDonald has skewed the facts of their lives for her own purposes. In MacDonald’s play Robert Browning (Matthew Edison) first learns of Elizabeth Barrett (Irene Poole) through his friend John Kenyon (David Schurmann), who is also Elizabeth’s cousin. John shows Robert that Elizabeth, a poet in her own right, has written a favourable review of Robert’s poetry. Soon the two are corresponding madly with each other (more than 500 letters in 20 months), falling in love through letters before they ever meet each other. MacDonald portrays Elizabeth as a recluse dominated by a controlling father so that a meeting is difficult to arrange. As in history Robert proposes to Elizabeth after their first meeting in 1845. The next year Elizabeth runs away from home, marries Robert and the two settle in Florence. It is there that Robert discovers Elizabeth’s addiction not only to laudanum but to morphine and ether. In Act 2 of the play Robert and Elizabeth repeat the same argument. He urges her to give up drugs because they ruin her health, they use up what little income they have and they offend him because he thinks their love should be enough to inspire her. She counters that she has been prescribed these drugs since childhood for her various ailments and that she needs them in order to write. 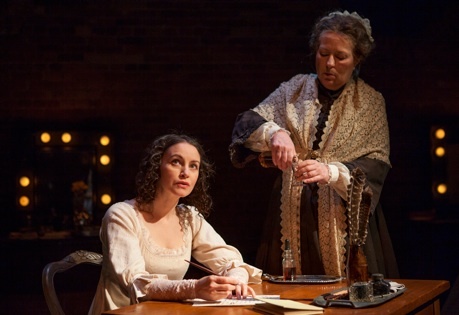 Elizabeth’s maid Wilson (Nora McLellen), who keeps the accounts and makes all the trips to the apothecary, affirms that she does not discourage her mistress’s habit because she wants her to keep writing. Eventually, Elizabeth tries to go off the drugs, suffers fit of madness during withdrawal, returns to drugs and the argument begins again. It is a serious flaw in the play that MacDonald is unable to make this conflict interesting and can only think of repeating the sequence several times. It is also a serious flaw that MacDonald gives no indication of the negative effect of the drugs. All we see is that they calm her down and allow her to write. If taken away they cause great distress. Elizabeth begins with 40 drops of laudanum a day which even in her time was considered a heavy dose. Far from being vigorous, bright and alert, addiction to opiates should make her enervated, dull and debilitated. Just think of the most famous morphine addict depicted in drama, Mary Tyrone in Eugene O’Neill’s Long Day’s Journey into Night (1956). Mary has only one addiction and descends into a listless haze less than 24 hours after taking her dose. Gibson, however, aided by Ken Gass’s direction, depicts Elizabeth as active, engaging in lucid arguments and with enough strength to have physical fights with Robert. And Elizabeth is addicted to two more drugs than is Mary Tyrone besides having a dependence on alcohol. This portrayal flies in the face of descriptions of Elizabeth that we have from those who visited the Brownings in Italy and saw that she barely ate. Nathaniel Hawthorne noted in 1858 that she was “a pale, small person, scarcely embodied at all”. Why does MacDonald bother to take up historical figures and then not portray them accurately? The answer is that she is trying to force her own agenda on Elizabeth Barrett to make her a feminist hero when the facts of Barrett’s life, though not her writings, make that very difficult. MacDonald overstates Elizabeth’s isolation at the beginning. John was the one to introduce her to Robert, but John also introduced her to other prominent figures such as Carlyle, Coleridge, Tennyson and Wordsworth. MacDonald would have us think that until she met Robert, Elizabeth’s father would only allow her to publish her work anonymously, when in fact The Seraphim and Other Poems (1838), published under her own name, attracted attention to her and Poems (1844), also under her own name, brought her fame. MacDonald claims that Elizabeth’s addiction stems from her father’s attempt to control her, whereas from age 15 on she had unexplained head and spinal pain and from 1838 on has some sort of tubercular disease. MacDonald would have us believe that when Elizabeth’s father disinherits her for marrying Browning, it is a shock. The truth is actually much stranger. Elizabeth’s father, Edward Moulton-Barrett forbade all of his nine adult children from marrying under pain of disinheritance. Edward was not singling Elizabeth out. She would know what eloping with Robert would mean. MacDonald worsens Elizabeth’s family life and denies her fame and recognition to make her defiance of her father a bolder act, when, in fact, she was the one who abided by her father’s anti-marriage stance longer than any of her adult siblings. It is true that Elizabeth was more famous than Robert when they married, but MacDonald would have us believe that Elizabeth was the only one who wrote during their married life. In fact, Robert published Men and Women in 1855. Yes, it was not well received at the time, but now it is considered of his three greatest books and contains such much studied poems as “Fra Lippo Lippi” and “Andrea del Sarto”. Meanwhile, MacDonald shows how Elizabeth accrues fame for her writing while Robert gains none. MacDonald does show that Robert encourages Elizabeth to publish Sonnets from the Portuguese in 1850, the collection that made her a literary star and is still her best-known work. Yet, these poems were all written before she and Robert were married and MacDonald gives Robert no credit after the poems’ success for his rightness in encouraging her. MacDonald shows us Elizabeth writing the verse novel Aurora Leigh (1857) about a female poet living an independent life in Paris. MacDonald portrays this as a bold feminist declaration. Yet, what MacDonald could have explored was the irony of a frail woman so dependent as Elizabeth on drugs, her maid and her husband, writing about a strong fictional character who is free of all of these. Finally, and worst of all, MacDonald, against any biographical evidence, has Elizabeth commit suicide with an overdose of laudanum. She thus makes Elizabeth’s death look like her own brave act when in reality Elizabeth died as a result of the gradual decline in her general ill health made worse by her multiple addictions. MacDonald gives Irene Poole the difficult task of making the mashup of reality and fiction in her character plausible. Under Ken Gass’s direction, Poole makes no attempt to demonstrate the deadening effect of opiate and ether addiction. Instead, Poole’s Elizabeth is high-spirited and lively, as if she were on uppers, not downers. Her Elizabeth is only sullen and raging when she is kept off her drugs. Misrepresenting the effect of opiates in general and in Elizabeth in specific does no one any good. Many of Elizabeth fellow poets like Coleridge, Keats and Shelley were also addicts, but that hardly means that MacDonald should portray Elizabeth’s belief that her creativity stems from her drug use without questioning it. In fact, even within her play, MacDonald blames Elizabeth’s father for getting her addicted, yet lets Elizabeth and Wilson praise her addiction for its positive effect. Poole is such a fine actor, especially in portraying suppressed emotions (viz. her Olga for Stratford in 2009 or her Manon for Buddies in Bad Times in 2014), that given a different text and different direction she could have made the contradictions in Elizabeth’s life fascinating instead of confusing and inexplicable. It is great to see Matthew Edison given a serious role for a change. He is wonderful in portraying Robert’s change in outlook from giddy joy when he falls in love with Elizabeth to a complex mixture of love, frustration and anger. David Schurmann, dependable as always, makes John our only touchstone with normality. We’d like to know more about his character than his kindliness and enthusiasm. If MacDonald is implying some intense male relationship, like that of Antonio to Bassanio in The Merchant of Venice, she does not pursue it clearly enough. It is also a pleasure to see Nora McLellan on stage again in a serious role. The pity is that MacDonald has made the role so small. Under Gass’s direction, Elizabeth’s maid Wilson seems to exude some sort of malice in knocking her out with ether and constantly drugging her drinks. Unfortunately, this is deliberate misdirection to create an artificial atmosphere of mystery, since we eventually discover that Wilson drugs her mistress at Elizabeth’s behest. Shawn Kerwin’s set is quite handsome with three paperlike drapes that descend to become floorcloths as if these characters lived only in a world of paper and ink. The middle drape is twisted in such a way that it looks like a tree, the one Elizabeth saw out her window at Wimpole Street as a child. One decision about the design and staging is quite peculiar. On the wall behind these three drapes are three modern makeup table with four modern chairs. The play starts with McLellan in her 19th-century costume as Wilson consulting a modern script at one of these tables and dressing the set as would an assistant stage manager. When not in a scene the actors sit near the modern tables and McLellan turns pagers of the script as if she were the stage manager or prompter. The point is obviously to underline the play’s nature as theatre. Yet, since the play is so clearly about poetry and addiction and not the theatre, it is hard to know what this attempt at metatheatricality is meant to accomplish. MacDonald’s mixture of the Brownings’ own words with her own prose and poetry works quite well, but when Elizabeth speaks about wanting to raise her son “not confined by gender” MacDonald’s anachronistic phrases can distract. MacDonald’s depiction of the Brownings’ falling in love through letters is a delight, but once the couple moves to Italy the tension diffuses and never rebuilds. It is hard to depict steady decline in an interesting way, but MacDonald does nothing to make Elizabeth’s decision commit suicide believable or necessary. This cast is of such a high calibre it could make a play about the Brownings quite effective. MacDonald, however, in trying to simplify their story as per a specific agenda rather than probe its many ironies, does not provide a script equal to the cast’s abilities. Photos: Matthew Edison and Irene Poole; Irene Poole and Nora McLellan. ©2015 John Lauener.